In a country where the car and the motorcycle are symbols of freedom it can be hard to explain how my mountain bike can arouse similar feelings. A two-wheeled vehicle that one pedals hardly fulfills the image of counter-cultural rebellion the way Harley motorcycles do in the movie, Easy Rider (one of my favorites, by the way). And yet, for me it does. My first savored moments of freedom occurred at seven years of age riding my bike. The bike had a purple banana seat and plastic streamers in the ends of the handlebars (it was the seventies, you had to be there) and I rode endlessly around our house in the circular driveway. A year later, I was off down the street, exploring other parts of the hospital campus. I have written before about growing up on the campus of a state mental hospital (see Life in the Mental Hospital), and one of the prime advantages of growing up in a campus-like setting is the lack of traffic. This meant I could bike down relatively quiet streets and explore. The added thrill came when I left the confines of the driveway and the house and could careen, happily, hands in the air, down a small hill. At eight years-old this was my first taste of freedom and I liked it. Years later, travelling in other parts of the world, often alone, I would stand somewhere in Europe and feel as if I was tasting again that peculiar, familiar taste in my mouth that I first tasted when I was eight flying down the hill away from my parents’ house. Free! It has a taste, you know, sweet, salty, mild. I still feel that even now when, approaching forty years of age, when I ride swiftly through clogged traffic past people in cars. I get that taste again in my mouth. Ha, I think, as I zoom past the impatient in cars. I’m outta here. I think of this now because Brian and I have been biking around town together. He’s in front, I follow. And I follow, not because I can’t lead us, but because we get into fights about which routes to take and it’s easier if I let him pick than try to convince him that my choice of route is faster. I learned this the hard way after one heated debate at an intersection on Clark and Wellington. But where was I? Oh yes, freedom. I grew up riding my bike and exploring town on it, but Brian didn’t. As a result, Brian’s first trip on a bike on a street was when he was thirty years-old in Baton Rouge, Louisiana, where he bought his first mountain bike. I bought a new one too, and together, we rode from our house to the campus of LSU to bike, like others do, around the many lakes that surround the campus. Soon after, Brian became as enamored of biking as I had been and on the hottest days with the worst ozone, he would still ride around those lakes. In the past few days, since we both have time off from teaching, we have been taking daily rides to the parts of the city with bad traffic or parking. We roll up on two wheels, lock up, and shop or eat. A bicycle in Chicago has meant a return to a kind of freedom that I experienced as a child. On two wheels, I’m propelling myself forward on my steam and I’m free (for the moment) of adult responsibilities. During the holidays, when traffic is light, we have the added bonus of deserted streets and not having to weave through cars and buses. (Brian is much better at this than I am). 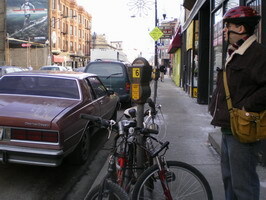 We ride lazily practically in the center of the street and side by side, engaged in conversation. The last few days have felt, for me, like that easy part of life when living is the same as careening down a hill with your hands in the air, laughing, not screaming. loved your story thanks. i may be moving back to chicago in the spring, and i’ve got a nice shiny mountain bike that is ready to go. very inspiring. So see you in the bike lanes! So you ride your mountain bike on the street? I have my old ten speed which I finally got out of storage. When I blew a tire by not missing an unexpected hole, I found it difficult to get a new innertube because Target and places like that had only mountain bike type tubes. I finally had to go to a specialty shop and found the only innertube they had in my size on the shelf. Waah! I do use a mountain bike in the city because of the MASSIVE, bus-sucking pot holes. I once saw the entire front end of a sedan fall into a pothole and then straight down into a bigger sink hole. There are debates about what bike to ride though. Many prefer road bikes with their lighter frames and faster, thinner wheels. With a mountain bike a lot of your energy goes into hauling the heavy frame and the rubber tires. I’ve thought about switching to a road bike for the speed, but somehow I just feel safer on my mountain bike with its fat wheels … and its easier to jump off and on curbs. Good point — at present we’re on the edge of a small town, so I don’t have too many curbs to jump off, although that pothole snuck up on me. I do like the lightness of my bike, although it’s an old Schwinn, so I’m not sure it’s all that light! I’m off to a cabin in the woods to write for a week — yay!